This is a Mexican fiesta packed into a pie. Sweet tangy tomatoes are the star and chilli and lime add some beautiful spice and zest to proceedings. Clive's is the home of truly tasty organic "free from" foods. From out of the converted woollen mill in Buckfastleigh where they're based, they make lovely gluten free pies and vegan and vegetarian pies, sourcing locally wherever possible and packing their things with the best ingredients. It goes without saying that there are no artificial flavours or preservaties involved. They're a true testament that "free from" foods in no way compromises taste or flavour. Gluten free flours (rice*, potato*, maize*, buckwheat*), tomato* (20%), palm oil*, water, onion*, carrot*, black bean*, sweetcorn*, cabbage*, haricot bean*, kidney bean* (3%), tomato puree*, green pepper*, courgette*, coriander* (1.0%), sea salt, garlic*, lime juice* (0.4%), herbs*, spices*, mustard*, chilli* (0.1%). Store in the fridge in the packaging. See best before date on the box. Freeze as soon as possible after purchase and before best before date and consume within six months. Store below -18°C. Do not refreeze once defrosted. Once defrosted use within 24 hours and do not refreeze. 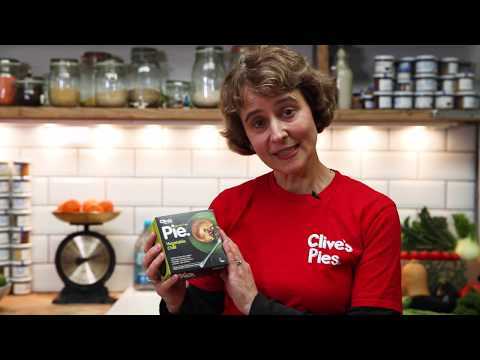 Remove from box and place pie (in foil) in the centre of a pre-heated oven at 180°C / Gas mark 4 or 160°C for a fan oven for 20-25 minutes. Allow to rest in foil for 3 minutes - then enjoy!